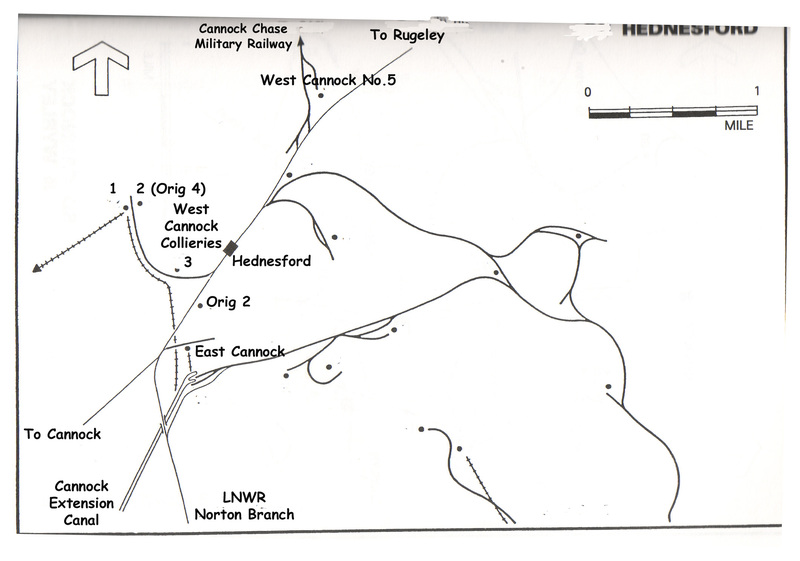 The first four of West Cannock’s series of five collieries were collectively known as Hednesford Colliery. The first four were: West Cannock No.1 Colliery, West Cannock No.2 Colliery (First site), West Cannock No.2 Colliery (Originally No.4), and West Cannock No.3 Colliery. Messenger 0-6-0ST Manning Wardle 166/1865. Bought from Cannock & Rugeley Colliery Co. circa 1914. Loaned to the War Department Cannock Chase Military Railway circa 1915, returned circa 1918 and scrapped in 1922. Stafford 0-6-0T Hudswell Clark 319/1889. Bought from T.W.Wood, Dealer 1915.. Still at Hednesford 1957, since scrapped. Topham 0-6-0ST W. Bagnall 2193/1922. Acquired new. Transferred to West Cannock 1955. Still there 1957. Topham was transferred to Foxfield Railway in 1973 and perfomed well there until 1987 where it went to the North Downs Railway and now resides in a thousand bits at the Spa valley Railway.Have tried to bring her home but no go yet. We have a 4mm model of ‘Topham’ in the museum, by Peter Stamper. Thank you for your interest and information – the Topham page in the West Cannock (Hednesford) section has been updated. Hi there, I’m using the ‘Kubrick’ theme – it seems to do everything I need. locomotive before starting my electrical apprenticeship in 1959. It was I think near the bridge on Hightown /Stafford Lane. It’s nice to hear about old times and steam engines. I don’t know if you have read my latest post on Hednesford (on the home page go into the ‘select category’ section and click on ‘Hednesford’). It shows your bridge having been uncovered during roadworks at the Bridge crossroads. I think they have covered it up again now.